Play this game with your child: Write two consonants at the top of a piece of paper (like c_t, p_g, etc.) and plug in different vowels to make words that are real and made up. It is important for students to be able to identify the vowel sounds in CVC words. Make it fun by playing games! Try writing two consonants on the board (like c_t, p_g, etc.) and plugging in different vowels to make words that are real and made up. Help your students review short vowel sounds as they identify which sound is in each word. Which Picture Shows the Short Vowel? 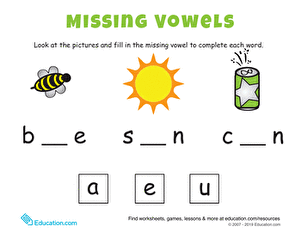 Help your kindergarten student get lots of practice identifying short vowel sounds as they complete this fun worksheet! Make comparisons between things that are heavy and light to help your child understand the concept of weight. When introducing the concepts of weight and capacity, it is important to introduce vocabulary such as "heavy" and "light." Do you know how much you weigh? 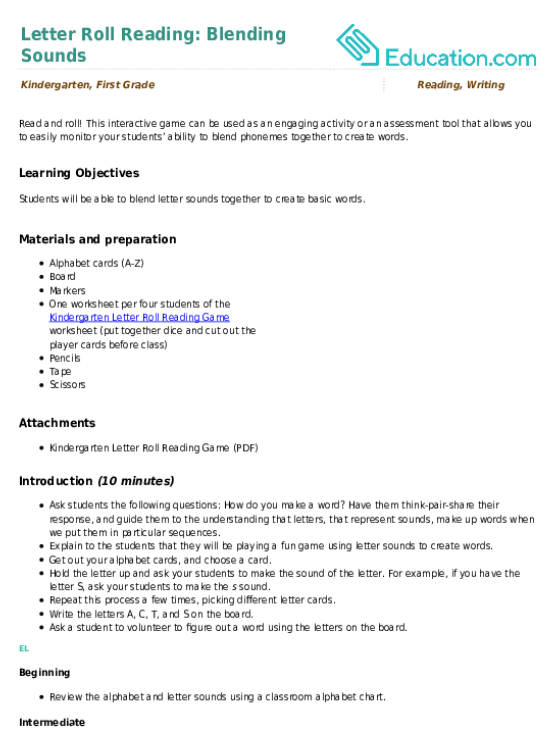 Introduce your kindergartener to the concept of measurement by weight with this fun comparison worksheet. Beginning measurement starts with relative sizes and weights; this worksheet asks your child decide which object is heavier and adds coloring into the mix! Help your child practice his skills with volume with this printable worksheet, which asks him to estimate how much liquid things can hold. Measuring Volume: How Much Liquid Can it Hold? 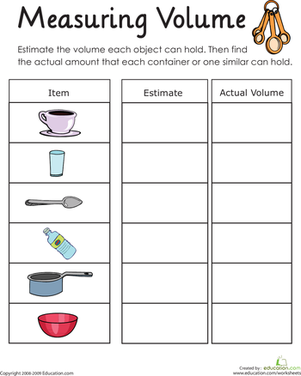 Help your child practice his skills with volume with this printable worksheet, which asks him to measure how much liquid items can hold. 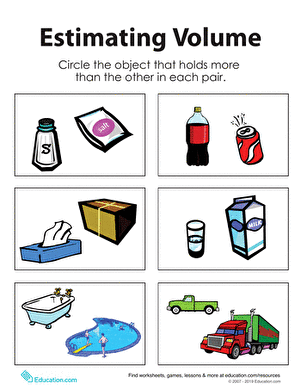 Help your kindergarten students practice identifying which items are heavy and which are light with this worksheet. 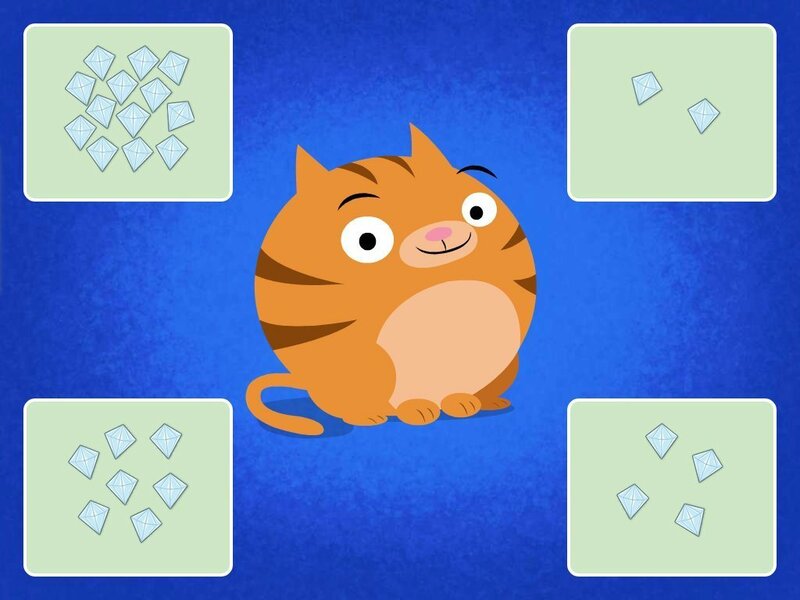 Kids compare different quantities and practice counting in this colorful quiz. Fill ‘em up! This lesson teaches students to compare how much different containers can hold. Get ready for some overflowing fun! Try reading a book with your child in a new way: read every other page, then have your child read the rest. Have students read just right reading books together. Encourage students to set up a plan for how to read the book together, such as reading with one voice or taking turns reading one or two pages. Caterpillars and the hard C sound come together in this colorful lesson. With help from the ever-popular *The Very Hungry Caterpillar* by Eric Carle, students will learn about metamorphosis while developing their phonics skills. 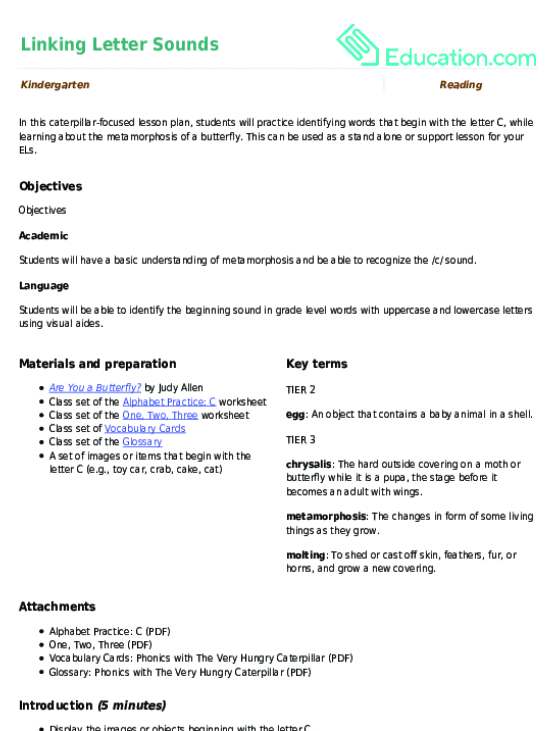 In this caterpillar-focused lesson plan, students will practice identifying words that begin with the letter C, while learning about the metamorphosis of a butterfly. 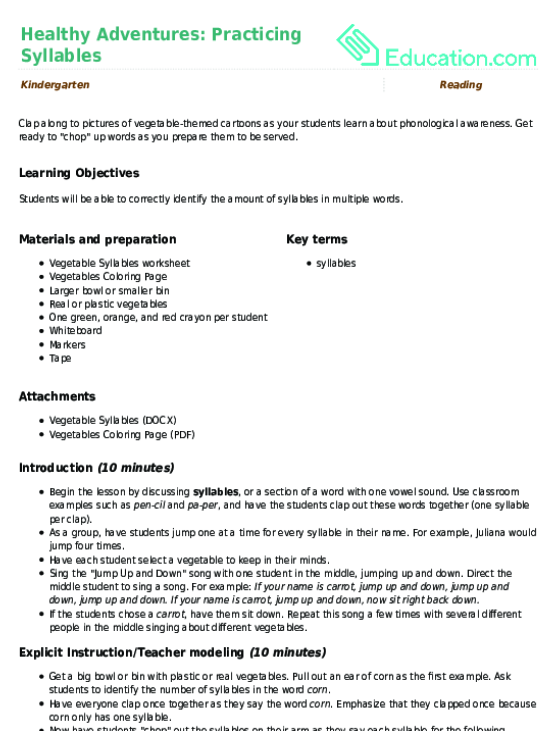 This can be used as a stand alone or support lesson for your ELs. 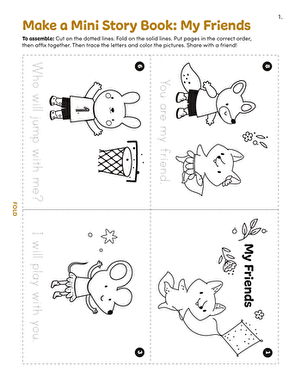 Featuring a story about a cat and mouse who make friends, this make-it-yourself mini book offers tons of reading (and coloring!) fun. 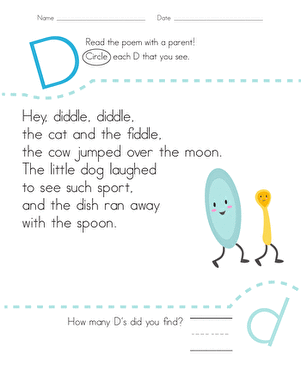 Help your child improve his reading with this printable phonics worksheet, which is all about finding the letter D in a nursery rhyme. 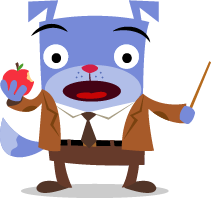 This story teaches students a moral and helps strengthen their sentence building skills. 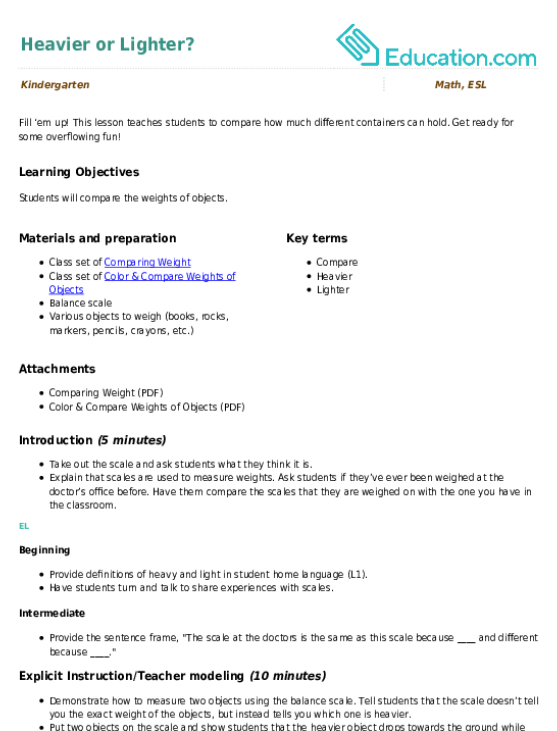 This worksheet helps introduce students to detail reading through a nursery rhyme. Have your child sound out all the letters in a word to help spell it. Make sure they do this multiple times as they write the word. When students are spelling words in their writing, instruct them to say the word several times. Make sure they are listening to all the sounds as they write it. This construction zone is all about building words! Sound out the word to help you spell it out. Get your word building hammers ready! These words need to be finished. Can your little speller help? Welcome to the word construction zone! Your little reader will practice putting the letters of the alphabet to use building words. 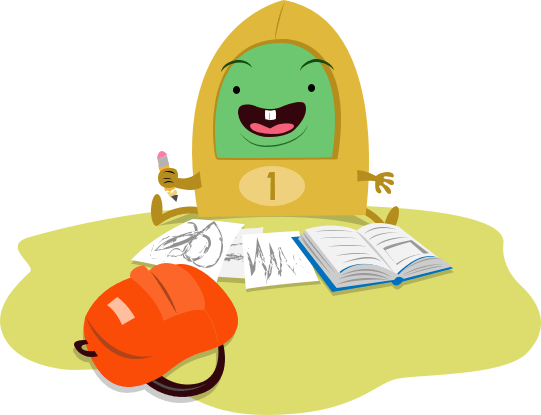 Clap along to pictures of vegetable-themed cartoons as your students learn about phonological awareness. Get ready to "chop" up words as you prepare them to be served.